In 2014, the CDC declared sleep deprivation a public health epidemic. Indeed, more than 1 in 3 Americans don’t get the requisite 7-9 hours of sleep every day. A poll by gallup in 2014 paints an even bleaker picture, with the average American getting 6.8 hours of sleep a night and 40% of the population getting less than 6 hours. To put this in to perspective, if you’re driving down the interstate on a 3 lane highway and passing between 2 vehicles, at least one of you is driving drowsy, which is equally as unsafe as driving drunk. Not all that encouraging. If we look at this from an historical perspective, the average American sleeps more than an hour less than the average American in 1942. In addition, 84% of Americans in 1942 stated they got the requisite 7-9 hours while only 59% stated the same in 2013. So why the drastic change? Certainly we can thank the increase in artificial lighting and blue light-emitting devices that disrupt circadian rhythms for being part of the problem. It also doesn’t help that most people spend a majority of their day inside, far away from the circadian rhythm-setting effect of the Earth’s yellow Sun. But this isn’t the only problem that needs to be addressed. While exposing oneself to the Sunlight and blocking blue light when we aren’t supposed to be exposed to it is helpful, for most people it’s not enough. I know this because I work with people in corporate wellness programs, individually in person, and online in my Circadian Retraining Program to address sleep issues like this. It helps a little bit to get people to fall asleep, but a lot of people have a hard time staying asleep or getting in to REM and deep sleep despite optimizing light exposure. There are other factors we can tweak including the feeding/fasting cycle, but again, not enough. It’s not until we go deep cover and look at other factors that people with major sleep issues finally turn the corner. And all these factors point to the same thing, your mitochondria. We kind of take sleep for granted, at least from a physiological perspective. Most of us just think it kind of happens like sleep mode happens on our computer. We’re just sitting around burning energy, we run out, and then we enter sleep mode to recharge the batteries. But sleep is literally nothing like this. Every process in your body requires energy to fulfill its tasks, and sleep is no different. A lot goes on while we sleep: We repair damage to our body at the tissue level, consolidate memories, clean junky proteins out of our brain, and repair our cells. To pull off all these tasks AND provide enough energy to our neurons to keep them alive, we need healthy mitochondria. Mitochondria are responsible for approximately 90% of the energy made in the human body. At the most basic level, nearly all of our energy comes from ripping electrons off the food we eat and processing them through the electron transport chain in the mitochondria. This isn’t to say that only energy processed through the mitochondria is important, just that energy must be processed through the mitochondria for optimal neuronal function. The same can be said for the other energy systems as well, as each energy system has their place to provide energy in a seamless manner. Both the phosphagen and anaerobic glycolysis pathways can provide energy at a much more rapid rate than the mitochondria, they just yield very little total energy. Having the benefits of all energy systems is a crucial aspect of health, but anaerobic glycolysis and the phosphagen system are always working as they don’t need oxygen or a fancy organelle to be built in the cell. Both support mitochondria, but don’t require them. But when you overeat and become sedentary, there isn’t a large negative effect on these energy systems, if anything they take on more of the load. A load they’re ill-equipped to take. Mitochondria can utilize a large number of nutrients to make energy whereas glycolysis and the phosphagen system are quite limited. Anaerobic glycolysis uses strictly glucose while the phosphagen system uses creating phosphate. To put that in to perspective, the mitochondria can use pyruvate & lactate that are generated from glycolysis, fatty acids, ketones, and amino acids. Recent evidence links changes in energy metabolism in the brain to specific sleep stages. There is an increase of lactate in the brain during both wakefulness after sleep onset and REM sleep. This is likely due to the increased energy needs in both wakefulness and REM sleep. We produce lactate through glycolysis when we need a lot of energy quickly. During normal energy demand, glucose gets converted to 2 pyruvate molecules and in the process generates 2 ATP and converts NAD+ to NADH. The pyruvate then enters the mitochondria and when fully oxidized generates 30-32 ATP. But when we need a lot of energy rapidly, pyruvate gets converted to lactate, which makes more NAD+ available to convert glucose to pyruvate. Lactate can then follow 1 of 3 fates. If the cell has the machinery to take the lactate in to the mitochondria, it will do so and produce the same amount of energy as pyruvate. If the cell cannot metabolize lactate, it ejects it in to the extracellular space and blood for other cells that can utilize lactate. The final fate that lactate can take is delivery to the liver where it gets converted back to glucose or pyruvate and redistributed throughout the body. An important concept to grasp here is that support cells in our brain called astrocytes create lactate when they use anaerobic glycolysis to make energy from glucose. However, once that lactate is generated, it’s ejected out of the astrocyte and taken up by neurons to be processed in their mitochondria. This is actually a pretty cool process that not only helps provide energy to the brain, it promotes an environment in the neuron that keeps oxidative stress low. Low oxidative stress means low inflammation. Neurons have a very low ability to increase glycolysis, and for good reason. Much of the glucose they take in is used to power the pentose phosphate pathway(PPP). 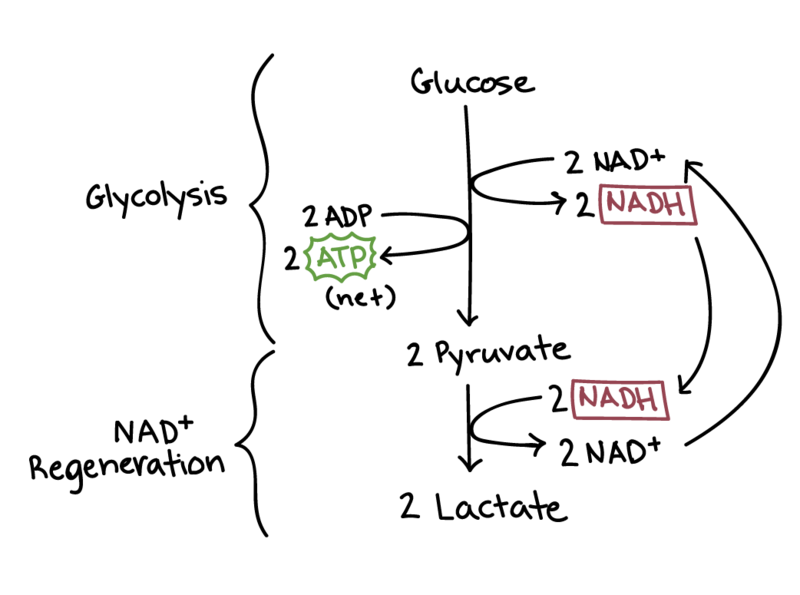 The pentose phosphate pathway increases something called the NADPH/NADP+ ratio. We don’t need to go in to detail on this one, just know that one of the important roles of the PPP in neurons is to make sure you keep recharging glutathione to keep oxidative stress low. This aids in the repair process while we sleep and prevents the accumulation of free radicals that comes with high energy production. But what happens if the neurons don’t contain enough mitochondria? Well, they wouldn’t be able to take up lactate, so it would accumulate outside of the cells. Based on the results of this study, this could promote wakefulness and cause you to awaken. Since the mitochondria is also the site where the excitatory neurotransmitter glutamate gets metabolized, glutamate could also accumulate and promote wakefulness as well. This can produce a vicious cycle. It turns out that excess brain lactate is removed via the glymphatic system. But when we don’t get sufficient sleep, the glymphatic system doesn’t work properly and could cause an accumulation of lactate and glutamate as well as other brain waste products that can affect brain function. Obviously we don’t want any of these things to happen on a regular basis. I think this is probably a major contributing issue for people who can fall asleep but have trouble staying asleep. Based on some pretty interesting results popping up in my Circadian Retraining Group, it also appears to be something that people can do something about. Lactate follows a fairly robust circadian rhythm with higher levels during the awake/active period and low levels during the rest/sleep period. This makes sense, during the day we produce more energy via anaerobic glycolysis to power muscular function than at night. If this occurs rapidly as during exercise it causes the creation of lactate in muscle cells and an increase of lactate in the blood. Lactate is then distributed throughout the body where it can be metabolized to form energy in the mitochondria. The primary areas this happens are the heart, liver, kidneys, gut, and yes, the brain too. In fact, lactate may be the preferred fuel source in these tissues during intense exercise as glucose is spared for the high power output muscles. The consequences of this effect in the brain are notable. First, lactate generated from working muscles can cross the blood-brain barrier and fuel neurons. Astrocytes also generate more lactate and neurons soak it up, increasing mitochondria to metabolize it. Of course this makes sense, you can only metabolize lactate in the mitochondria. This accumulation of lactate will promote glymphatic flow, clearing the brain of toxic products such as amyloid beta, and potentially make the brain better equipped to do so when you sleep. So what does that mean for lactate accumulation during sleep? Well, it’s not like those mitochondria go away when you sleep. In fact, utilizing them more during the day makes them more efficient at generating energy, reduces the generation of free radicals, and promotes the repair and recycling of damaged mitochondria. Basically, proper environmental conditions during the day set the stage for optimal sleep at night. This isn’t the only data backing up the relationship between exercise and sleep. A study in children found that low cardirespiratory fitness, which is dictated heavily by the number of mitochondria you have and thus your activity level is associated with poor sleep. Another found that people with low cardiorespiratory fitness were more likely to suffer insomnia symptoms, with the number of insmonia episodes per week being greater in those with lower cardiorespiratory fitness. And finally, another study found that people who maintained their cardiorespiratory fitness through middle age were less likely to report sleep problems as they got older than people who saw a decline in cardiorespiratory fitness. All the data seems to be pointing in one direction: Maintain your mitochondria, maintain your sleep. But what exactly is cardiorespiratory fitness(CRF). CRF is essentially a cheap and easy way to measure how well we use our mitochondria, measured as VO2 max. VO2 max is the maximum amount of oxygen you can consume per kg of mass per min. And since we know that it’s the mitochondria using all of the oxygen, CRF/VO2 max are essentially measuring how well our mitochondria are producing energy. Admittedly, it’s not all about exercise, exercise is just one component. Our circadian rhythms play a large role in helping us maintain our CRF as we get older, which I covered in a blog you can find here. Since circadian rhythms help set our sleep/wake cycle, locking them in is a double whammy for producing plentiful, high quality sleep. Sleep problems are common in our society for a number of reasons. Certainly there are exceptions, but one of the biggest drivers of poor sleep in our modern society comes down to poor maintenance of mitochondria through the lifespan. Two of the greatest drivers of mitochondrial dysfunction in modern human societies are obesity and getting older, which also happen to be associated with declining cardiorespiratory fitness. It’s not surprising that declining physical activity also comes with both issues. Another important factor that comes with both is circadian disruption. The circadian clock not only helps set the sleep/wake cycle, it also helps set mitochondrial quality control and mitochondrial oxidative capacity. This is why the health of your mitochondria is crucial to getting adequate, high quality sleep.